Akashi 5 years old Sherry Cask is a limited bottling aged exclusively in Sherry cask with strong and beautiful fruity notes. 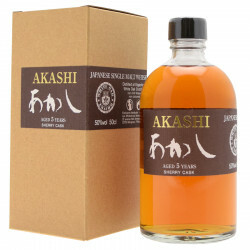 With Akashi 5 years old Sherry Cask, the small distillery White Oak offers a limited bottling aged exclusively in barrels that contained Sherry wine. This Japanese whisky, without coloration nor cold filtration, offers powerful and beautiful fruity notes brought by the Sherry maturation: dried fruits, prunes, red fruits. Perfect for an original tasting, Akashi 5 years old Sherry Cask is intense and rich with a delicate mouth. The history - if not the legend - of Japanese whiskey starts with Masataka Taketsuru, founding father of Japanese whisky, who embarked on a two-year journey to Scotland after World War One to learn the art of distilling. When he returned, Shijiro Torii, founder of Suntory, relied on Taketsuru’s knowledge to build the Yamazaki distillery in 1924. A few years later, Taketsuru took off and established his own company, Nikka, still recognized today for the quality of its malts. Japanese whisky became very popular after World War Two with the renewed prosperity. Most Japanese executives and managers of companies based on the US model started enjoying whisky as part of an after-work convention destined to foster the company’s team spirit. Taketsuru was not the first to distil whisky, as White Oak offered older whiskies. Located in Akashi, on the coast of the interior sea of Seto, the White Oak distillery obtained its license to distil whisky and other spirits as early as 1919. The distillery is today owned by the Eigashima Company, one of the oldest sake producers in Japan, established in 1679. It became one of the most famous distiller of the traditional Japanese alcohol, and the first to bottle sake in 1899. Nose: intense with fruity and vanilla notes. There are aromas of prunes, dried fruits and almonds. Palate: it confirms the first approach and powerfully expresses residual flavours of Sherry with typical notes of dried fruit and almond. Final: we finish in delicacy with a final all subtleties that share the flavours of fruits and white flowers.